Brown rice can be easy to cook and very nutritious. 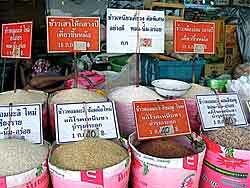 Today a growing number of people concerned about healthful eating are turning from consuming white rice to whole-grain brown rice, even in Thailand. But many of them complain that it takes a lot more time and water to cook brown rice and sometimes the result can be a little mushy. More worrisome is the fact that few of them are aware that when they cook brown rice without proper treatment ahead of time, they may end up getting only a small fraction of the nutrition stored in the grain, There also are a number of anti-nutrients contained in whole grains that can potentially cause harm if not neutralized. 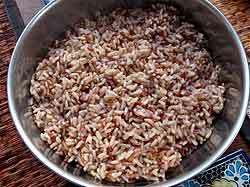 Whole-grain brown rice is a seed and like most seeds, it contains phytates– nature’s own preservative and insecticide which lock in nutrients to keep the seed viable until conditions are ideal for it to sprout. When the grain is still new (less than a year after harvest), the phytates (and other anti-nutrients) in the bran are especially intact, keeping the grain bug-free as insects know not to eat it at this stage since they can be harmed by doing so. (In humans, the phytic acid contained in these compounds binds with key minerals , especially calcium, magnesium, iron, copper and zinc and can inhibit their absorption in the intestinal tract, leading to mineral deficiencies.) Over time, if the conditions for storage are less than ideal, the phytates eventually break down and the fragile rice bran oil turn rancid, and when they do, bugs begin to infiltrate and feast on the grain that has lost nature’s protection. For those of us who are gardeners, we know that hard-to-sprout seeds benefit from soaking in warm water overnight. The moisture and warmth send a signal to the germ of the seed that life-supporting conditions are now present. The seed unlocks its nutrients by breaking down the phytates that until then protected the seed from spoiling, and begins to germinate or sprout. The same is true of whole-grain rice (as well as wheat and other whole-grain cereals, nuts and dry legumes). When we soak it overnight, or for several hours, especially in warm water since it is the seed of a tropical grass, the potentially harmful phytates break down, making the full range of nutrients available to the rice germ to push forth new life. At this stage, the unlocked nutrients also become available to us when we consume the rice. I’ve always soaked whole-grain rice before cooking, mainly because this treatment makes the rice not only easier to cook, but taste a whole lot better. Several years ago I came across an article in a health and nutrition journal that gave me another reason to tell my cooking students why they should soak their brown rice before cooking. Notably, intensive rice research conducted in Japan over the past two decades revealed how the nature of the nutrients in whole-grain rice changed when given a water bath to awaken the grain. Curious scientists were eager to discover how long the grain needed to be soaked for the the full range of nutrients locked inside of it to be fully released. If I recall correctly, the research found that the ideal number of hours is twenty-two (22). This interesting piece of information got me soaking my brown rice one evening to be cooked the following evening, or close to the recommended twenty-two hours. 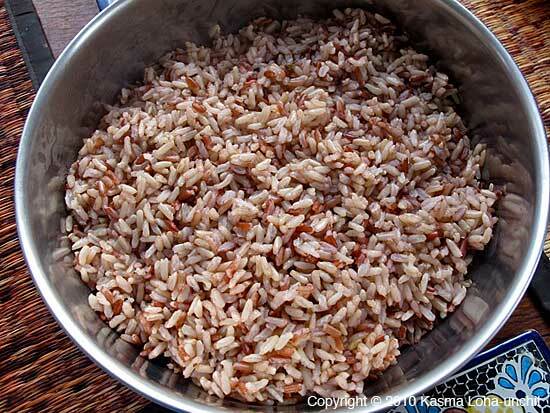 In the past, I’ve soaked whole-grain rice only about three to four hours, or overnight, before cooking – particularly black sticky rice which swells when soaked, requiring little water and time to cook. I experimented with soaking for a full day brown jasmine rice mixed with a small amount of a red rice called “kao man bpoo” (literally “crab fat rice” but unfortunately sold in the USA by a less than appealing name of “red cargo rice”). 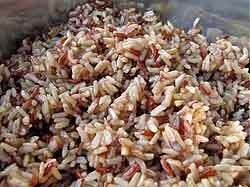 This red rice was one of the first whole-grain rice to be embraced by the health food movement in Thailand as especially nourishing. I used warm tap water to start but didn’t bother with maintaining the warmth for the entire time of soaking. The result was indeed amazing! 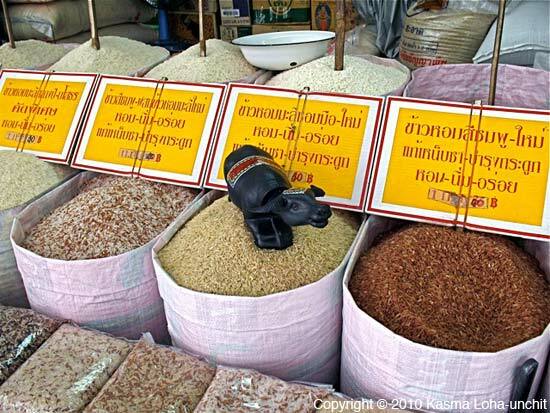 The grains absorbed a lot of water and grew fat, with the germ – or the “nose” of the rice as Thais call it – enlarged as if they were getting ready to sprout. Being an avid gardener, that was quite exciting to see. The soaked grains exuded a sweet fresh aroma as if they had come to life – as if they had just been harvested from the rice paddy! The grains took a little less water to cook than white rice (if you like your rice al dente) and about the same length of time as white rice using my usual method of steaming rice taught to my cooking students (read on). The cooked grains stayed whole, looked beautiful and, best of all, tasted wonderful – with a delicious nuttiness and invitingly fresh fragrance – much more so than when soaked for the three to four hours I used to do in the past. I am now convinced that the fully released nutrients are what add to the tastiness of the rice. So, next time you cook brown rice, soak it this evening to cook tomorrow evening. 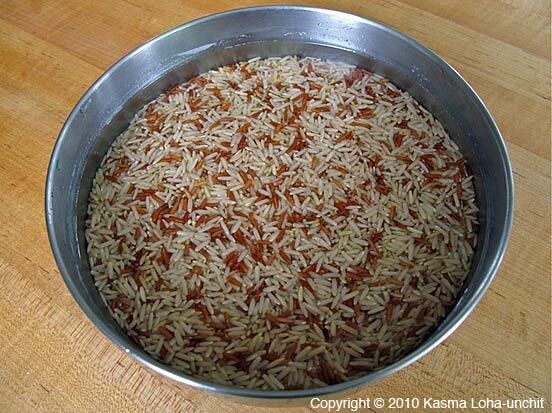 I usually rinse the rice a couple of times, then cover with plenty of water as much of it will be absorbed by the grains. If it’s too much trouble to maintain warmth for the duration of the soaking time, room temperature works just fine. In fact, if you soak the rice in warm water for that long, fermentation can take place and produce a slightly off smell. It is, therefore, recommended that you change the water a few times during those 22 hours if warmth is maintained the whole time. For me, in my northern California kitchen, I find soaking the rice at room temperature for all those hours woks well enough in awakening the grain. I like to steam the rice using the same method I use to cook white jasmine rice as described on my website. (See Steamed Jasmine Rice Recipe.) This technique is a true steam method unlike one-compartment electric rice cookers which actually boil rather than steam the rice and, therefore, produce a less tasty result. All you need is a deep heat-proof bowl and a pot large enough to accommodate it. Place a trivet of some kind in the pot on which the bowl containing the rice can rest. Look in the cookware section of large Asian supermarkets for such a utensil, or you can improvise by using a small overturned dish, such as a ramekin, or even an empty tin can cut away on both ends, Fill the pot with a couple of inches of water and bring to a boil. In a separate kettle, boil some water. Drain the soaked rice, lightly rinse once and drain again. Place in the heatproof bowl and level out the rice. The bowl should be about half full with rice. Place the bowl on the stand in the pot and add hot boiling water to the rice – to about half an inch above the grains (for al dente) to three-quarters of an inch (for softer rice). When the water in the pot below the lifted bowl comes to a rolling boil, cover the pot and turn the heat down to medium, or to a level where you can still hear water boiling in the pot and see steam escaping from the edge of the lid. Let steam for about 25 to 30 minutes. After the rice is cooked, you can keep it warm for a long time by simply turning down the heat to the lowest setting. With this method of steaming, you need not worry about burning your rice and the bowl is very easy to clean once you’ve dished out the cooked rice. 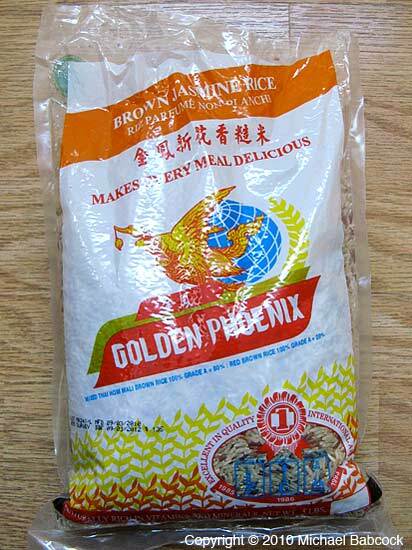 For a delicious brown rice meal, try the Golden Phoenix label’s blend of jasmine brown rice which contains a small amount of red cargo rice for added color, flavor and nutrition. Buy a bag that shows a date of harvest or shipment of less than one year. It’s available in five- and ten-pound bags in many large Asian markets. The bulk of Golden Phoenix’s rice come from Northeastern Thailand where among the most fragrant jasmine rices are grown. At some point in Thailand you will come across the saffron-robed Thai monks; they are very much a part of Thai life, even in the cities. 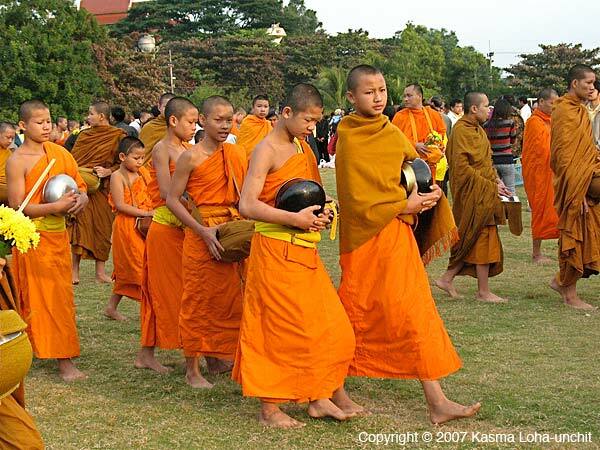 These young novices (not yet full-fledged monks) are part of a merit-making ceremony in Chiang Mai on the occasion of the King of Thailand’s 80th birthday in 2007. This three ladies work at the resort where Kasma has her tours stay each year in Mae Hong Son. Nothing like a friendly smile to make you feel welcome! The Karen (pronounced “Gu-rian”) are one of the hilltribes found in Thailand. Note: Alas, alas. This restaurant is now a clothing store. This is a blog about a good restaurant for buying noodles at Pak Bara pier in Satun Province, Thailand. There’s really only one reason to go to Pak Bara pier: it’s to catch a boat to Tarutao National Park. I’ve been there perhaps 10 times over the years, always accompanying Kasma on her small-group trip to Southern Thailand; and the reason we go to Tarutao is to snorkel. Koh Lipe, where we stay, used to be a pristine, uncluttered beach; now it is wall-to-wall resorts and bars. If it were not for the snorkeling, we would not go there. 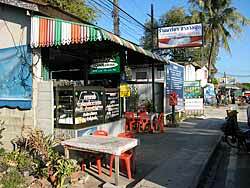 We usually charter a boat to visit the islands and like to get moving reasonably early in the morning. So Kasma piles everyone into the vans and runs us over Pak Bara Pier, the departure point for the boat, and we stop to eat breakfast (or lunch, on our return trip from the islands) at a little restaurant called Maleeya. As you drive towards the pier, Maleeya is on the left as you approach the end of the street. The first picture above shows the outside view and the second picture shows the bright yellow sign that you can look for. 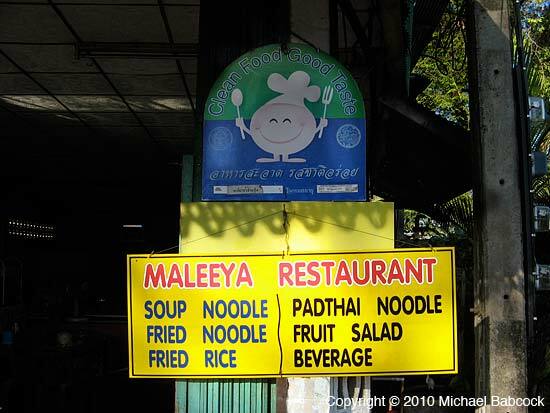 Kasma always feeds us noodles here: Pad Thai (on the menu as “Padthai Noodles”) for breakfast and Pad Kee Mao (Drunken Noodles, not on the menu) for lunch on our return. 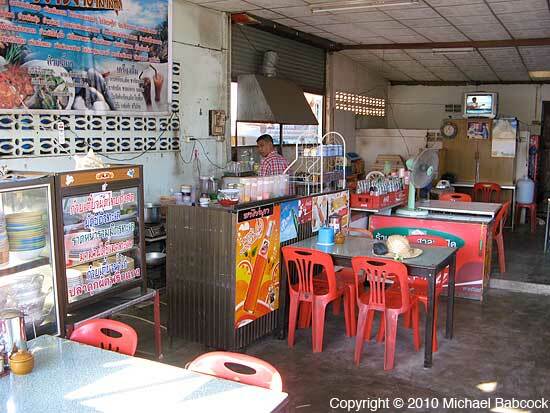 Maleeya is a clean restaurant, run by a friendly Muslim couple. 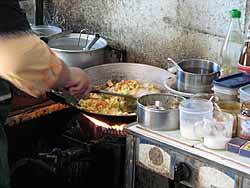 Everything is always cooked fresh to order and they do a very nice job. 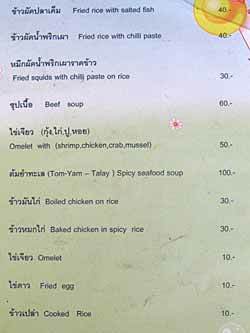 I’ll include photos of the menus at the bottom of the post — they also make fried rice, green curry, fried chicken and various other dishes. 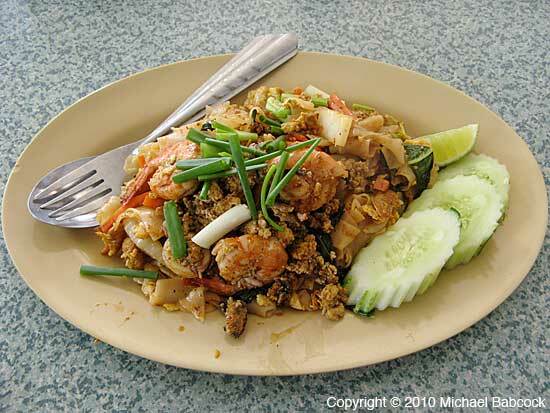 I took these pictures of Pad Thai the last time we ate at Maleeya in February 2010. As with all noodle dishes, this Pad Thai was served with a condiment sent containing dried chillies, fish sauce, sugar and green chillies in vinegar (the exact contents may differ slightly from place to place) so that you can further season the dish yourself. 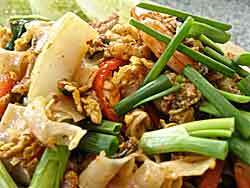 Directly above are the Drunken Noodles (Pad Kee Mao). 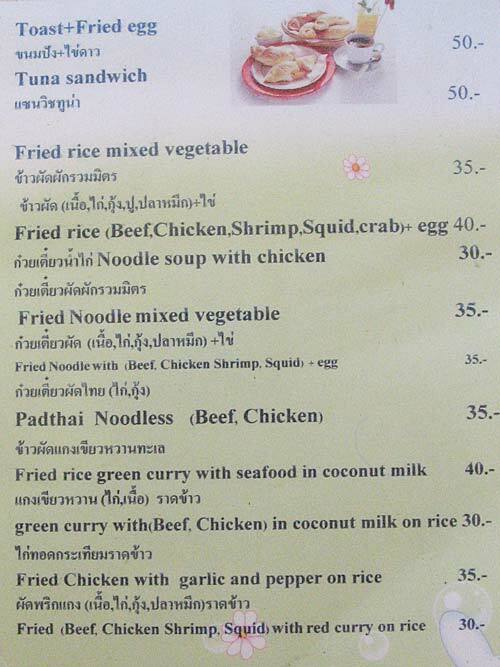 Although they are not on the menu, you can probably order them (as Kasma does) – just tell them you want Guay Dtiow Pad Kee Mao and add gkai for chicken or neua for beef. 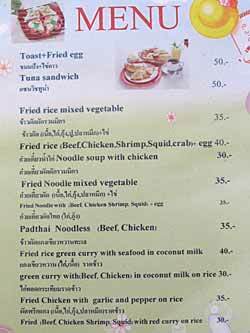 Here’s the menu – some basic noodles, fried noodles, stir-fries and Thai dishes. Give the noodles a try. If you click on the menu you’ll see a larger version. 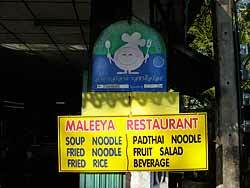 So next time you have occasion to catch a boat to Tarutao, give some noodles from Maleeya a try. Written by Michael Babcock, October 2010. Updated May 2017. 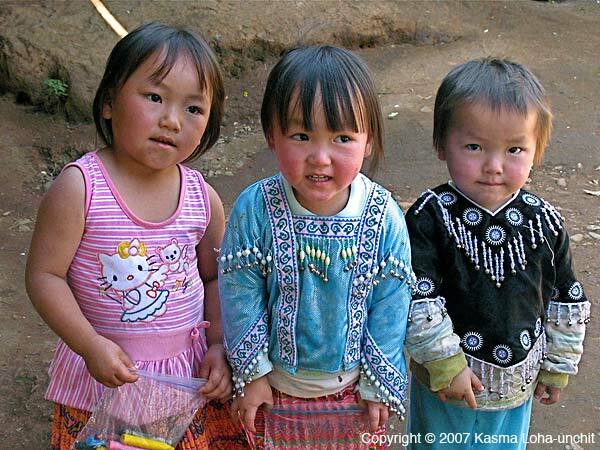 Here’s a photo of three appealing Hmong children taken during a recent trip by Kasma at a village on the way from Mae Hong Son to Bahn Rak Thai in the north of Thailand. 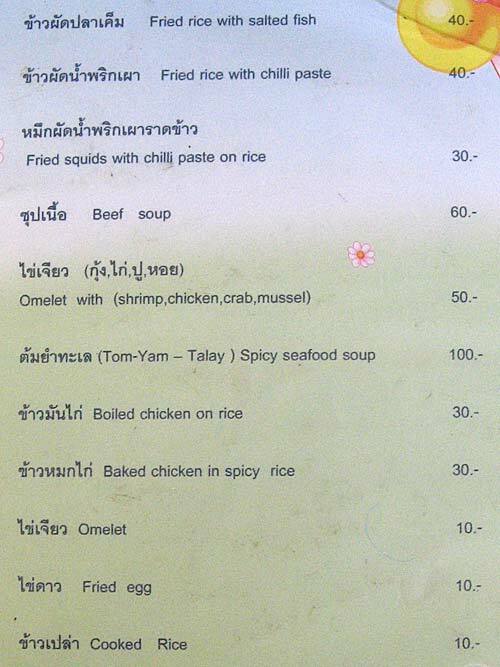 We seem to be doing lots of pictures of Thai people latel. At Thanksgiving time there’s a great option for a main course at your Thanksgiving feast – it’s Roast Duck and Pumpkin Curry. It’s that time of year again when pretty winter squashes in different sizes, shapes and colors attract my attention at produce markets near my home. I can’t resist picking up an assortment to take home to brighten up the greenhouse window in my kitchen. 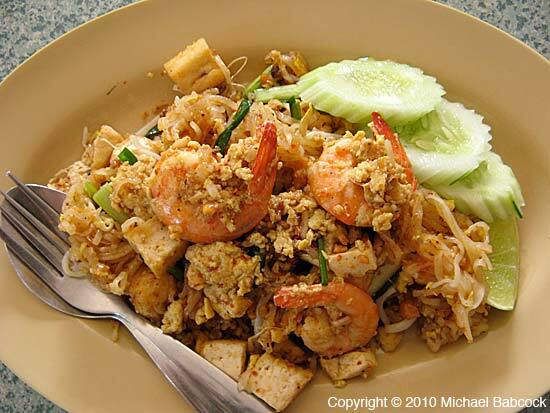 Most of them sooner or later end up in the pot, pan and wok, adding sweetness, richness and the golden color of autumn to comfort foods that warm the cool evenings of the season. The curry paste I prefer with duck is red curry. 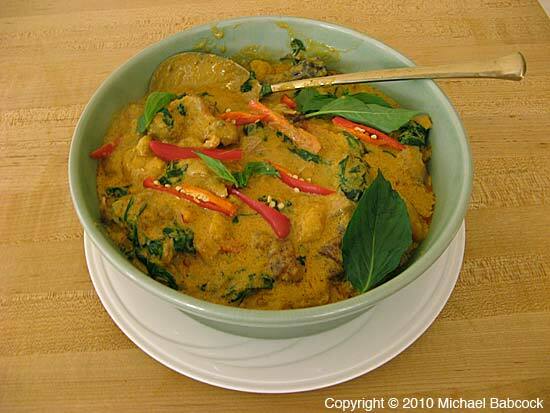 Unlike Indian curries where dry spices figure prominently, the popular Southeast Asian red curry is decidedly herbal with the majority of ingredients comprised of moist tropical herbs and roots, such as lemon grass, galanga, kaffir lime peel, cilantro roots, kachai (an aromatic ginger), garlic and shallots. To these are added a few varieties of dry seeds, such as peppercorns, coriander and cumin, and fermented shrimp paste. It is “red” from both fresh and dried red chillies, and although other curries may have a reddish color, red curry is a particular combination of ingredients that makes it more herbal and lighter-tasting than say, massaman and panaeng curries, for instance. Save yourself the trouble of roasting the duck for the curry by buying one of the beautifully roasted ducks seen hanging in front of duck shops in Chinatown or in the cooked foods section of large, full-service Asian supermarkets. Have the duck chopped up for you into bite-size pieces, but tell them you do not need the sauce. 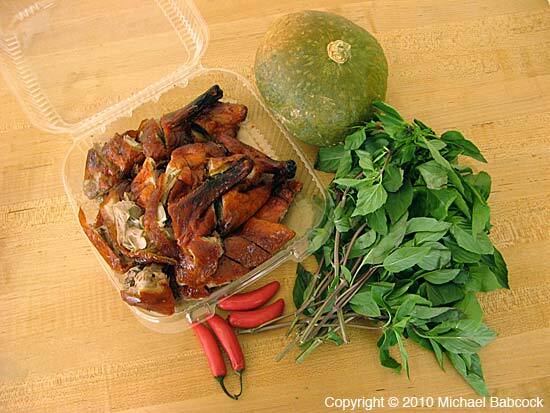 Cook the duck with bone in and skin on to impart a rich roasted duck flavor to the curry sauce. Before serving, skim off and discard the duck fat that has melted into the sauce during cooking. Of course, other kinds of winter squashes may be used for the curry, so if you have a preference for others of autumn’s golden fruits, try them in this curry. The calabasa now available in many farmer’s markets is delicious and should not be missed. See our website for more in Thai recipes. Cut the kabocha in half, scoop out the seeds and pith. Placing the cut ends flat on a surface for balance, peel and discard the greenish skin. Then cut into 1 to 1 1/2-inch chunks. Do not shake the cans of coconut milk before opening. 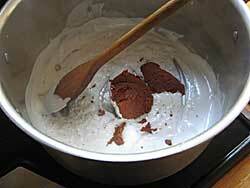 Spoon 2/3 cup of the thickest cream off the top of a can into a large pot placed over medium-high heat. Reduce cream until thick and bubbly (about 3 minutes), then add the curry paste. Stir and mush the paste into the coconut cream and fry for a few minutes until it is very aromatic and darkened in color. Then pour in the remaining milk from both cans, stirring well to dissolve the paste to make a smooth rich sauce. Add 1 1/2 Tbs. 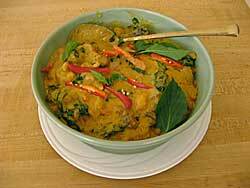 of palm or coconut sugar, stirring well to blend into the curry sauce. 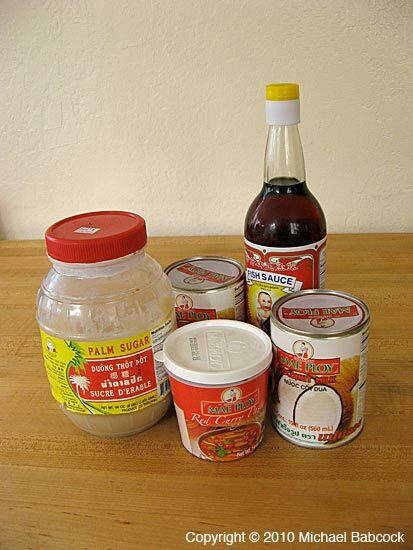 Taste and add fish sauce only as necessary to salt to the desired saltiness (may not be necessary with some brands of curry paste which are already highly salted). 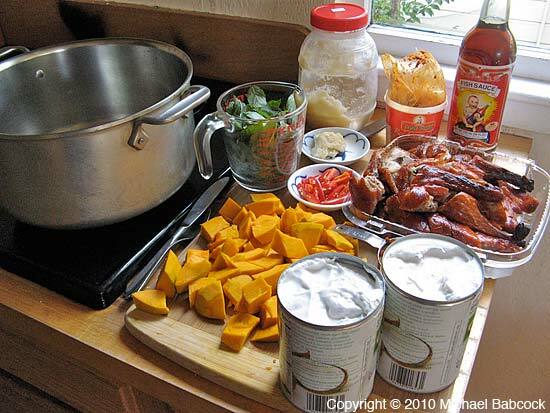 Add the kabocha chunks and duck pieces. Stir well into the sauce. 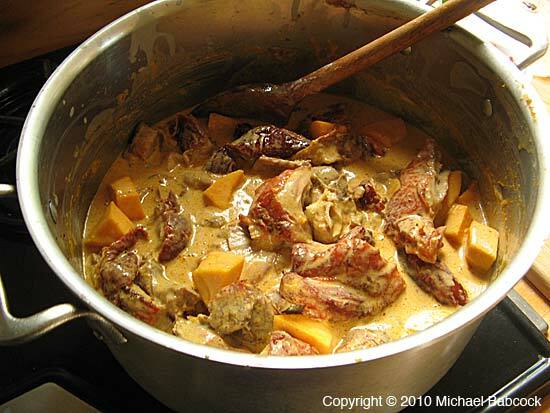 If there is not enough curry sauce to cover most of the duck and squash pieces, add more coconut milk; or if the sauce already looks plenty rich, add 1/2 cup of water instead, as the squash and duck will thicken and enrich the sauce even more when they are cooked. Return to a boil, then lower heat to medium, or just enough to boil the sauce gently. Cook partially covered, stirring occasionally, until the squash is tender, or cooked to your liking (15-20 minutes or more). 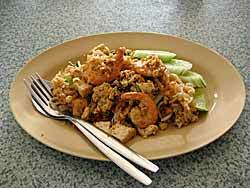 Taste the sauce and adjust as needed with fish sauce and palm sugar to the desired salty-sweet combination. If more hotness is desired, stir in the slivered chillies. 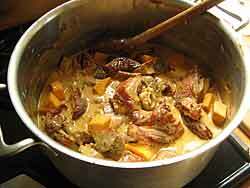 If a lot of fat has cooked out from the duck, skim out the oil floating on top of the curry sauce. Then stir in the basil until it wilts to a bright green color. Turn off heat and spoon curry into a serving dish. Garnish top with basil sprig(s). Written by Kasma Loha-unchit, November 2010. You are currently browsing the Thai Food and Travel Blog blog archives for November, 2010.